Considering solar? Make the change now to take advantage of the full 30% federal tax credit before its scheduled reduction in 2020. As of 2020, the federal tax credit for solar will reduce from the current 30% to 26%. At the current percentage, TFS's residential customers save, on average, $6,000 on their solar energy systems. Customers interested in solar can still take advantage of the full 30% tax credit by having their system installed before the end of 2019. We encourage anyone interested in solar to make the switch sooner than later to ensure your ability to take full advantage of the 30% credit, as scheduling in the second half of the year will experience higher traffic of homeowners looking to install before the deadline. Additionally, we anticipate that TEP will further alter rate structures, decreasing energy buyback rates from solar production by 10% on September 22nd. Anyone who has completed an application for their solar system prior to this date will be exempt from the changes. Technicians For Sustainability has, for the fourth consecutive year, been recognized for being among companies creating the most positive environmental impact based on an independent, comprehensive assessment administered by the nonprofit B Lab. Honorees are featured on B the Change, the digital Medium publication produced by B Lab, at http://www.bthechange.com. Technicians For Sustainability is honored in the Best For Environment list, which includes businesses that earned an Environment score in the top 10 percent of more than 2,400 Certified B Corporations on the B Impact Assessment. The full assessment measures a company's impact on its workers, community, customers and the environment. To certify as B Corporations, companies like Technicians For Sustainability must complete the full assessment and have their answers verified by B Lab. The Environment portion of the B Impact Assessment evaluates a company’s environmental performance through its facilities, materials, emissions, and resource and energy use. Companies answer questions about their transportation/distribution channels and the environmental impact of their supply chain. The assessment also measures whether a company’s products or services are designed to solve an environmental issue, including products that aid in the provision of renewable energy, conserve resources, reduce waste, promote land/wildlife conservation, prevent toxic/hazardous substance or pollution, or educate, measure or consult to solve environmental problems. Honorees scoring in the top 10 percent set a gold standard for the high impact that business as a force for good can make on nature around the world. 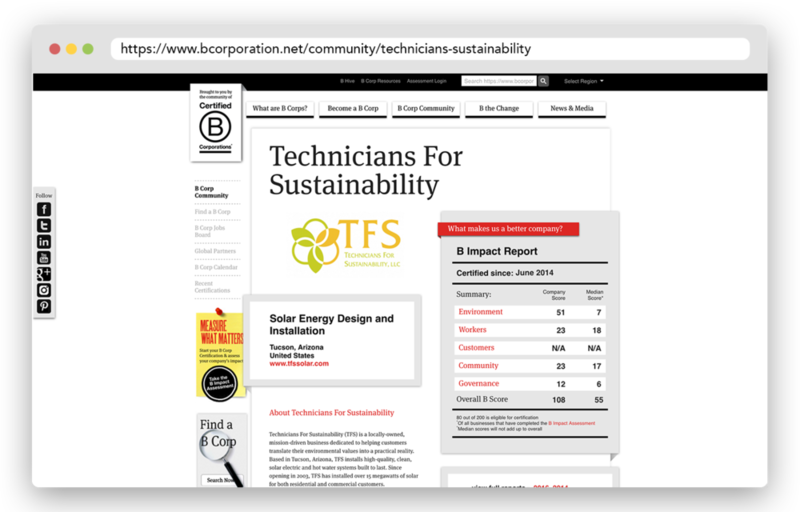 Technicians For Sustainability made the list thanks to exceptional practices in its implementation of solar energy including its sustainable sourcing practices, reducing transportation impact, and its commitment to reducing industry waste and recycling.. The 228 Best For Environment companies come from 72 different industries and 25 countries. B Lab simultaneously released separate lists recognizing B Corporations as Best For The World Overall, Best For Community, Best For Customers, Best For Governance and Best For Workers, which can be found at bthechange.com/bestfortheworld. (Not available until June 12.) In the fall, B Lab will release the Best For The World: Changemakers and the Best For The World Funds lists. At TFS, we believe that corporations and businesses are not only instruments of social change but have a responsibility to support our communities and the natural environment. We are proud to be part of the B Corp movement and support the belief that corporations exist to sustain thriving communities. Becoming a certified B Corp has been a way to formalize the commitment to moving beyond profit to include planet and people. We hope that our involvement in the B Corp movement inspires our customers and our partners to continue to make changes, as we all focus on doing well by doing good. Click here to see our full B Corp profile. In order to make 15,000 annual miles travelled in a Bolt carbon free it would require a 1.5 to 2kw solar energy system in Tucson. For the past 18 years we’ve been helping Tucsonans reduce the carbon footprint associated with their house's energy use. Transportation has always felt out of our reach to help with as an organization, beyond our bike advocacy efforts. When asked about our use of the Nissan Leaf, we often suggested that an electric vehicle (EV) would make a great second vehicle for a household. With the Bolt's range making it suitable as a primary household vehicle, not only can household emissions be reduced but also the transportation-associated emissions in a significant and impactful way. Our experience with both the Nissan Leaf and the Chevy Bolt are that in-town driving results in about 5 miles per kWh, while freeway driving uses more energy and results in about 3.5 miles per kWh. Both numbers assume that the AC is not being used. Electric vehicles require 1 kilowatt hour (kWh) for every 5 miles of driving. Assuming an annual usage of 15,000 miles, the average driver will require a total of 3,000 kWh per year to meet their driving needs. A typical solar panel is 350 watts, making a small installation size of about 5 panels enough to provide the necessary 3,000 kWh to keep an electric vehicle on the road each year. Based on typical solar energy system costs, all annual transportation expenses could be covered by a ~$3,000 system after the federal tax credit. The price after tax rebate is at or below the average new car sales price in the US. It now seems within reach of many Americans to take a real bite out of their carbon footprint with an EV. Given that the previous options for EV (BMW, Leaf, etc,) were similarly priced and the Chevy Bolt gets twice the range, if this vehicle and others like it are adopted in mass, they will pave the way for increased adoption of lower cost EV's that provide the range and performance to meet the needs of the average American driver. On top of that, they are significantly more fun to drive than the Prius! Electric Vehicles: Why Plug In? A practical alternative to fueling up. Adding a second EV to the TFS fleet. Since adding a second EV to the TFS fleet this year with the Chevy Bolt, we have been spending a lot more time thinking about the overall experience of going electric on the road, and how current technology is making the switch more seamless than ever. Addressing climate change is an integral part of why TFS is here - we are constantly asking what can TFS do to push farther toward a solution? What can we do as individuals and a community? In the US, over a quarter of all greenhouse gas emissions are from transportation. Although the principal product of our work at TFS, installing solar panels, reduces our collective carbon emissions, we are also focused on reducing the emissions caused by our operations. 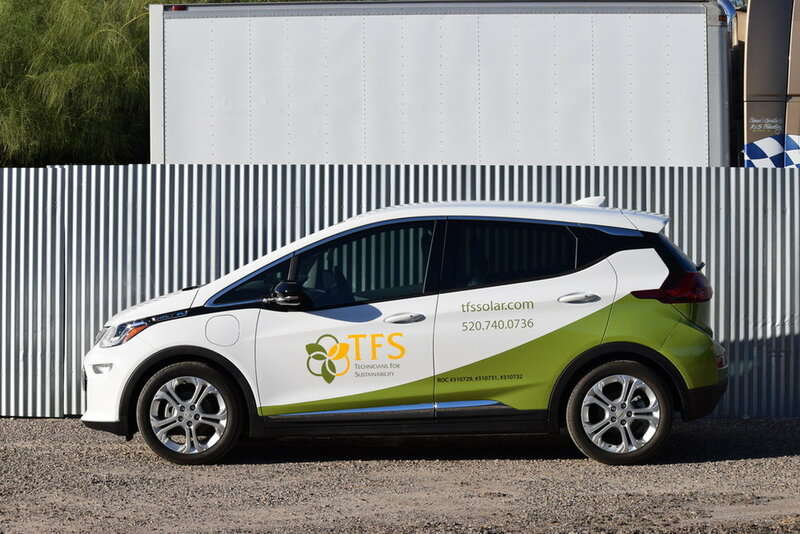 In pursuit of this goal, TFS has integrated hybrid and all-electric vehicles to our fleet over the last 8 years, and we recently purchased an all-electric, solar-powered Chevy Bolt. Why is now the time for EV's? For TFS, the exploration of more sustainable transportation started years ago. Having used alternative fuel vehicles as part of our company fleet since 2005, TFS has recognized from the onset the need to address our transportation in order to transition to a clean, renewable energy based economy. In the early years, we used biodiesel from recycled grease and oil, as fuel for our diesel vehicle, as well as a variety of electric assist bike options for our operations. As we grew, these became less practical and we began to use Toyota Tacoma trucks; the most fuel efficient truck we could buy at the time, averaging a 20% fuel efficiency increase over other trucks. We've also had a fleet of Toyota Prius (Priuses, Prii, Priem) over the years, and generally found the Prius to be a great car, but sluggish to drive and ultimately still gas-based (our staff reported that the Prius doesn't exactly have the most exhilarating driving performance). We also added an all-electric Nissan Leaf in 2010, and having charged it off of our solar energy system, have been pleased with it's ability to transport us carbon free for almost 8 years. As early adopters of an electric vehicle, we were both delighted with its ability to transport us “gas free”, and acutely aware of the Leaf's range limitations, especially on a few memorable trips back from Green Valley. It's incredibly fun to drive, though, shedding any sluggishness of the hybrids and adding in the pleasure of instant and smooth acceleration. This is part two of our EV blog series. If you missed out on the first entry, detailing our experiences with the Chevy Bolt, you can find it here. Stay tuned next week for our final EV series blog, all about charging. This year, we found ourselves again in need of an additional car for our fleet. Wary of the Chevy brand but intrigued by the advertised range (which is well-over double that of the Nissan Leaf!) we took a chance and welcomed an all-electric Chevy Bolt to our fleet. Our initial experience has surpassed expectations to the point of giddiness. On its inaugural drive, from Phoenix to Tucson, (a trip not even possible in the Leaf) there were still enough miles left to drive to multiple site visits around town and an 80 mile buffer to prevent any sensation of range anxiety. After its first full charge, it was driven 250 miles . There were still 69 miles of range left - meaning that with limited AC use and thoughtful driving, the vehicle has 300 miles of range potential. Another significant improvement over the Leaf is that the remaining mileage estimate seems to be more accurate. The “remaining mileage” estimate in the Leaf tends to drop much faster than that actual distance traveled. The Bolt’s remaining mileage estimate on the other hand seems more accurate, further reducing (or dare we say even removing) range anxiety. While part of the promise of all-electric vehicles is that they are emissions-free at the tailpipe, if they are powered from the grid in Tucson, they still emit approximately 2lbs of CO2 per kWh used. This begs the question of how these all-electric vehicles compare to the Prius in terms of overall carbon emissions. One gallon of gasoline produces just under 20lbs of CO2. At 50 miles per gallon, carbon emissions associated with driving the Prius will be about 20lbs for 50 miles of driving. In our initial trips in the Bolt, it has averaged above 5 miles per kWh. This means that it would take 10 kwh to drive 50 miles, which equates to 20lbs per 50 miles. So the carbon emissions are approximately equal assuming we are powering from the grid rather than renewables. Our TFS Bolt is powered by our solar energy system at our downtown Tucson office/warehouse, which eliminates the emissions created by grid charging and results in a truly emissions free driving experience. The opportunity to power an all-electric vehicle from on-site solar means that people can drive in town free of range-anxiety and be powered by clean, renewable energy! Part two of our EV blog series, 'Electric Vehicles: Why Plug In?' is now live, and can be found here. Local solar company Technicians for Sustainability (TFS) fulfilled a long-held goal this year when it converted its business into an employee-owned cooperative. The business, which has focused on installing residential and commercial solar energy systems in Tucson and Southern Arizona since 2003, is now cooperatively owned by 14 employee-owners, with more employees in the process of becoming owners. Kevin and Nicole Koch, the co-founders of TFS, had been talking about putting more of the company in the hands of its employees for years, and decided in 2016 to embark on the journey of transitioning TFS to an employee-owned cooperative. It took a full year to sort out the accounting and logistical aspects of changing the business, in addition to on-boarding the first set of employee owners. On January 3, 2017, Technicians for Sustainability officially became an employee-owned cooperative with 14 employee owners. TFS now has a Board of Directors made up entirely of employee owners. These board members, who are elected by the employee owners, help guide the big picture of the company. Decisions are also made at employee-owner meetings, and owners have special venues for bringing forth concerns and ideas. Anyone who has worked at TFS for one year is eligible to become a worker-owner. There is a candidacy process that can take between 6-12 months, and all new employee-owners are voted in by the existing owners, and also purchase a share in the company. In addition to becoming an employee-owned company in 2017, TFS continues to lead the way as a sustainable company, making the B Lab “Best for the World” list for a third year in a row. B Lab, a nonprofit organization that serves a global movement of people using business as a force of good, named TFS both “Best in Environment” based on independent assessments of company policies, as well as placing TFS in the “Best for the World: Changemakers” list for companies that have most improved their overall impact on the environment, their employees, their community, and more. Today, Technicians For Sustainability was recognized for being among companies creating the most positive environmental impact based on an independent, comprehensive assessment administered by the nonprofit B Lab. Technicians For Sustainability is honored in the Best for the Environment list, which includes businesses that earned an Environment score in the top 10 percent of more than 2,100 Certified B Corporations on the B Impact Assessment. The full assessment measures a company's impact on its workers, community, customers and the environment. To certify as B Corporations, companies like Technicians For Sustainability must complete the full assessment and have their answers verified by B Lab. The Environment portion of the B Impact Assessment evaluates a company’s environmental performance through its facilities, materials, emissions, and resource and energy use. Companies answer questions about their transportation/distribution channels and the environmental impact of their supply chain. The assessment also measures whether a company’s products or services are designed to solve an environmental issue, including products that aid in the provision of renewable energy, conserve resources, reduce waste, promote land/wildlife conservation, prevent toxic/hazardous substance or pollution, or educate, measure or consult to solve environmental problems. Honorees scoring in the top 10 percent set a gold standard for the high impact that business as a force for good can make on nature around the world. Technicians For Sustainability made the list thanks to exceptional practices in its implementation of solar energy including its sustainable sourcing practices, reducing transportation impact, and its commitment to reducing industry waste and recycling. The 180 Best for Environment companies come from 66 different industries and 24 countries. B Lab simultaneously released separate lists recognizing B Corporations as Best for the World (overall impact), Best for Community, Best for Customers, Best for the Long Term, Best for Workers and Best for the World: Changemakers, which can be found at bthechange.com. Is there a deadline coming up for solar? Yes (and no!). There are some changes coming to TEP’s “Net Metering” policy, which makes it more favorable to go solar before those changes are implemented. The next Arizona Corporation Commission (ACC) hearing on the issue is anticipated by August 14th, 2018, at the earliest. The implementation of the new rules will be effectively immediately at the time of the hearing. What is the current status of Net Metering for TEP customers? TEP customers who apply for interconnection of a grid-tied solar electric system before the ACC decision on Phase II of the rate case will qualify for net metering, and will be grandfathered on that rate structure for a period of 20 years from the date of their solar installation. Once the application for interconnection has been accepted by TEP, the customer has 180 days to install the system and have it inspected. When is the ACC going to make a decision on Net Metering? The hearing for Phase II of the TEP rate case is anticipated for August 14th, 2018, following numerous delays. This means that the issue will not reach the Commissioners for a vote until then at the earliest, at or after which the grandfathering deadline will occur. For a link to the schedule, please see the Commission's webpage. What will replace Net Metering for future solar homeowners? There are several changes that we know about, as well as considerable uncertainty about other factors. What we know is that solar electricity that is exported from a home will have a different value than the energy purchased or imported from TEP. That value will be set every year, and customers who apply for interconnection during that year will keep the established rate for 10 years. We also know that the export rate cannot decline by more than 10% per year. What we do not know is what the export rate will be initially set at, nor what the underlying rate structures available to solar customers will be. These factors will have a profound impact on the economics of future solar installations within TEP service territory. Is there anything I can do to voice my support for rooftop solar? Make sure the changes the ACC approves are a gradual step so that innovation is encouraged, but the opportunity to go solar remains viable for homeowners/business owners. Don't impose a "grid access fee" above $0.75/watt DC. Anything more than this will jeopardize an economically viable option for people to adopt solar. Set the initial solar “export rate” high enough that as it declines, there are at least a few years where traditional grid-tied solar is still economically viable for homeowners. This will allow the solar industry to come up with solutions that provide additional benefits to the grid beyond standard energy production, such as storage capabilities and load shifting. Don't add additional meter fees for solar installations. Voice your opinions as to why it is important to continue to allow homes and business in Tucson to install solar energy systems. In our opinion, the main reasons include technological innovation, including growing community resiliency, empowerment of individual participation in energy generation, and fostering a vibrant Tucson community/economy. We encourage you to share why you think solar energy is important, and why customer-owned solar energy systems are valuable. Encourages citizen participation in renewable energy generation. Takes steps toward recreating the energy grid, and modernizing it to be more resilient, dynamic and efficient. Without encouraging these 'baby steps' now, it will take much longer to develop a grid that can provide '21st century' value. Provides a platform for technological innovation. Supports community vitality because people want to live in a place where solar energy is abundant. Tucson Electric Power (TEP) has recently begun offering new pricing plans. Out of the four plans that TEP offers, the residential Basic pricing plan is most compatible with solar and is thus the plan we recommend for solar homeowners. The idea is lower energy charges by shifting a majority of your usage away from on-peak hours when customers typically use energy the most. Time-of-use and solar: This plan will move away from the 1:1 exchange rate by decreasing the value of energy during the day and increasing it during TEP's peak periods. Meaning, when you are not at home consuming electricity during the day, the value of your solar production will be at the lower rate. When you return home at the end of the day, where the solar production is low or zero, you will purchase electricity at the higher rate. This plan makes sense for customers who do not have solar, and who can avoid using energy during the peak periods. The idea is to space out your use of large appliances and equipment such as air conditioning, lighting, computers, copiers and printers during on-peak hours to reduce your peak energy demand and increase your savings. Peak Demand and solar: The majority of our clients would not do well on this plan. Although the energy charges are lower, you pay the highest power usage during peak demands. There are no advantages with this plan if you get most of your energy from solar. However, if you are a high energy user (more than 1500 kWh/month) and get half or less than half of your energy from solar, this plan may work for you if you are very proactive with your usage. Under this plan, you would need to shift your large appliance usage to operate when the solar is producing (i.e. not at the end of the day) and decrease the use of power at other times. The best way to manage your usage under this plan is with a "demand controller", which prioritizes the operation of large appliances such your AC and water heater. The idea is to shift the majority of your usage to off-peak hours and avoid the simultaneous use of equipment during on-peak hours to maximize your savings. Demand Time-of-use and solar: This is a more complex version of the Time-of-Use (TOU) plan. This plan will not work well with solar unless you are looking to actively manage your energy and power usage. Solar customers can expect to see higher bills with this plan. This plan is TEP's traditional "two part" rate. There is a fixed part of the rate for having service, now set at $13/month, and a variable part of the rate based on the amount of energy you use each month (in kWh). Under the current Net Metering rules, energy produced for customers subscribing to this plan either offsets energy usage from TEP, or is back fed into the grid and you are credited for later use on a 1:1 basis. In other words, if you are paying $0.11/kWh for electricity, every kWh your solar electric system generates will be worth $0.11. This plan is the simplest to work with for solar customers, and will provide the most savings in almost all cases. New and prospective solar customers will be able to get in under grandfathering rules for the current, more favorable net metering structure so long as they have their TEP interconnection application in by the implementation of Phase 2 proceedings decisions, likely August 2017 or later. Everyone who signs up for solar with TEP, from here on out, will be subject to a monthly bi-directional meter fee of $2.05/month, or a one time payment of $143. This will not apply to customers who already have solar or who had their applications in before the hearing this week. TEP customers will be able to stay on the traditional two-part electric rates, however the basic service charge will go up to $13/month (from around $10). There will be three tiers in the rates instead of four as previously. As you use more electricity during your monthly bill period, the price goes up with each tier. This is a positive step for energy efficiency. A more tiered structure is important for encouraging energy efficient decisions, i.e. when people make decisions about replacing appliances in their homes. The total rate increase (including basic service charge increase) that was approved for TEP was 8.5%, but the increase for residential customers as a whole will be 12.6%. This applies to all electric customers, not just solar users. The net metering grandfathering window will end this week (Feb. 4th). All solar customers who sign up after that time will be subject to the new net metering rates, which include a $.077/kwh export rate. (That means the extra energy they produce during the day will be credited at that rate rather than the retail rate it was previously credited at -more like $.12-$.13). That new export rate is fixed for a 10 yr period, and may go up or down after that. The ACC does not maintain an active twitter handle, but previously used: @AZCorpComm and is still tagged by others in tweets. With the above-mentioned changes to solar rate structuring on the horizon, now really is the time to go solar. Customers who go solar before changes are enacted will receive grandfathering, securing their access to current rates, which currently offer an average solar energy system repayment window of 8 years. Technicians For Sustainability (TFS) becomes only the seventh solar installation company in the US, and the first in Arizona, to receive NABCEP Company Accreditation. NABCEP (North American Board of Certified Energy Practitioners) is - in their own words - "the most respected, well-established, and widely recognized certification organization for North American solar professionals." The NABCEP Company Accreditation program provides a way for residential renewable energy installation companies to distinguish themselves by adhering to a set of industry recognized best practices, establishing a set of benchmark requirements with respect to staffing and policies. Since their inception, TFS has aimed to offer the highest quality solar energy systems available, with the finest trained staff, and top-notch customer service for life of the systems they install. Preceding company-wide accreditation, TFS had seven staff members that held individual NABCEP PV Installation Professional certifications, demonstrating a high level of commitment to quality from the company’s staff. During this time, multiple other TFS team members passed the requisite examinations for NABCEP Entry Level PV credentials, strengthening TFS’s preparedness for Company Accreditation with a demonstrably skilled workforce. Why is rooftop solar good for Arizona? It connects people to their energy use and generation. It encourages people to participate in our community's energy use and policies. It paves the way for a more resilient and secure energy grid in the future, with electric vehicles, batteries, etc. It creates an economically vibrant community to live in. Solar energy adoption and energy efficiency are both in the long term public interest. Preserve net metering or, if changes are to be made, to have slow and gradual reduction in net metering with current solar owners grandfathered in. The ACC should provide grandfathering of rate structure and net metering for the numerous Arizonans that have invested in solar while the Commission supported it. The rules of the game shouldn’t be changed midway through their investment in solar. Potential Change Note: TEP has changed their request, and only seeks to effect consumers who go solar after the implementation date of the forthcoming decision. No abrupt changes in rate structure or net metering, which are devastating to the adoption of solar. The ACC should make changes to rate structures gradual, either through optional new rates or with changes that are less than 5% different per year. The people that will be most impacted by the changes being proposed are lower income citizens. Any changes in rate structure should continue to put increased costs on higher energy users which incentivizes energy efficiency and doesn't put more financial burden on low income users. Make any and all changes in a way that continues to encourage people to put solar on their homes. If the ACC determines that long-term changes to rate structures should be made, they should be gradual changes that continue to encourage people to put solar on their homes and to focus on energy efficiency. Change how we pay for electricity in a way that reduces the incentive to conserve energy and focuses instead on keeping maximum energy use at any given moment of the day down to a minimum. Increase the current fixed charge that we all pay on our electric bills (from ≈ $10 to $15/month). Lower energy using households, which are often the lower income households, would be more proportionally hit by this increase. Drastically change net metering, or in other words, reducing the $ value of solar energy that you produce and don't use right away during the day from ≈ 10-12¢ per watt to less than 6¢ per watt. How would this impact Tucsonans? About half of ratepayers will pay more per month than they have been while the top 15% of users will end up paying less. Anyone with an average electric bill of less than $100 per month is likely to pay more under this proposed rate structure. Reducing net metering would deflate the current win-win situation of solar for homeowners. Note: Bookmark this page! We will be continuing to follow news and developments over the coming weeks, and will keep this post updated regularly to reflect those changes. There are 5 candidates running for 3 open seats on the Arizona Corporation Commission (ACC) this fall. The ACC regulates our utilities, including TEP and Trico, which serve the Tucson area. The Commissioners decisions will have a profound impact on the future of energy in Arizona, including how much and what types of renewable energy we install as a state in the coming years, as well as the payback on solar that consumers receive. TFS urges you to vote for the ACC commissioners who will best represent your vision for the future of energy, water, and the environment in Arizona. Below are statements from the ACC candidates, as well as links to relevant news articles which we hope will help to inform your decision. Protect consumers from massive rate hikes. Complicated pricing schemes that only benefit the profits of monopoly utility companies are not fair to the hard working people of Arizona. Clean up the corruption that has overtaken the Arizona Corporation Commission and stop APS and other utility companies from spending RATEPAYER money to buy elections. Unlike their opponents Andy Tobin & Boyd Dunn, Tom & Bill will work with current Commissioner Bob Burns to force APS and other regulated utilities to fully disclose campaign spending and prevent them from secretly spending millions of dollars to hand-pick commissioners who will be puppets for a pro-utility agenda. Restore integrity to the Commission so that it works for regular people again, not political insiders and big corporations. The Commission shouldn't be doing the bidding of big utility companies. It should allow every customer the opportunity to choose how they produce & consume energy for their own property. Unlike the majority of the current Commission, Bill & Tom believe property rights and individual freedom are more important than the profit margins of monopoly utilities. Implement a Code of Ethics for the Arizona Corporation Commission. This code will prohibit commissioners from having relatives who work for regulated utilities, secretly communicating with regulated utilities, using state resources for campaign purposes, and supporting one company's financial interests over competitors, among many other things. The code of ethics will ensure integrity and accountability are restored to the Commission in order to protect consumers. Bill Mundell was one of the ACC commissioners who voted for and established the Renewable Energy Standard. After some time off of the ACC, he is looking to be re-elected as a commissioner. Both candidates are explicit in their support of solar in general, as well as rooftop solar specifically. Bob Burns is currently serving as an ACC commissioner. Website. Bob Burns has led the charge asking APS to disclose it’s political spending in the 2014 election. He has also focused on emerging technologies. Andy Tobin is currently serving as an ACC commissioner after being appointed to fill the seat left by Susan Bitter-Smith when she was forced to resign. He is running to servea full-term elected seat as a commissioner. Website. Protect the Grid. Arizonans in all parts of the state must have access to a reliable electrical grid that is well maintained and affordable to the taxpayer. Water. While California faces draconian measures to conserve water because of years of no planning, Arizona has led the way in water management, which has allowed our state to grow and thrive. Now, the Corporation Commission must work with water companies across Arizona to ensure that their water is safe, their infrastructure sound, and that they provide top-tier customer service to all citizens. Lean Government. Since being appointed as Commissioner, I have led the effort to get the Corporation Commission to adopt Governor Doug Ducey's "Lean Government Initiative" and use it in every aspect of Commission business. In other agencies I have managed, Lean saved my employees and the taxpayers time and money by simplifying agency processing, developing a more positive organizational culture, and evaluating our purpose and practice to best serve Arizonans. Securities. Our senior citizens must be protected from unscrupulous financial managers who seek to take advantage of those seniors who have scrimped and saved throughout their lives so that they might live comfortably in their golden years. The Commission must have a "No Tolerance" policy for wrong-doing in this area. The role of a commissioner is very similar to that of a judge, to be the impartial decision-maker based on the facts presented to you on each individual case, regardless of personal feelings or outside influences,” Dunn said. “That is how I ran my court, and that is how I will serve as a Corporation Commissioner. The function of the Arizona Corporation Commission is critically important to the success of our state. It’s time we move past all the rhetoric and return to the basics of protecting the public interest. Boyd Dunn: “I don’t think it’s been proven absolutely for me,” said former judge Boyd Dunn. Bob Burns: Has expressed skepticism of human-caused climate change. Bill Mundell and Tom Chabin: Both acknowledge climate change and both have said they would push for the state to shift away from reliance on coal-fired power plants to develop more alternative energy sources — including solar and wind. Andy Tobin opposes forcing APS to reveal its political spending. Bob Burns, Tom Chabin and Bill Mundell support new rules to require utilities to disclose their political spending on the political seats that regulate the utility. Boyd Dunn says it’s legal for APS to not disclose their funding. Loft Cinema has gone mobile! In collaboration with Technicians For Sustainability, Loft Cinema has unveiled their solar-powered mobile movie theater - making them the first member of the Solar World Cinema movement in the US! Peggy Johnson, Executive Director of Loft Cinema, has spent years dreaming of having the ability to bring art films, documentaries, and classic cinema to communities without convenient access to an independent movie theater, introducing a new audience to an art form that they may not otherwise be exposed to. That dream of accessible, on-the-move cinema can now be fully realized with Loft’s new solar-powered mobile cinema, the first of its kind to debut in the US. The van utilizes a 1.24 kW solar electricity installation, comprised of 4 LG 315 W modules, paired with an off-grid inverter and battery array, installed by Technicians For Sustainability, allowing the van to store energy generated during day-time hours for evening operation, inflating the screen and projecting up to 3 hours of film and audio..
Loft’s solar-powered mobile cinema will travel to neighborhoods throughout the Southwest and beyond, as well as become a regular staple at festivals and other outdoor events in Tucson, enabling a simple solution for on-the-fly screenings of cinematic and multimedia experiences to audiences of unlimited attendance. Read more about the Loft's new EcoVan in Tucson.com's recent write-up here. From the outset, the Catalina Foothills homeowners sought to build their new solar-powered home in the Tucson Foothills with minimal impact on the surrounding desert environment. Moving from an energy-intensive residence equipped with pools and a fishpond/garden, the homeowners wanted to ensure that their newly constructed home would have a smaller carbon footprint. Technicians For Sustainability (TFS) is a locally owned, mission-driven business, committed to walking their talk. They provide businesses, public institutions, and residential homeowners with high-quality, clean, renewable energy systems, helping to translate environmental values into a practical reality. The company employs proven technologies to meet customer’s specific needs, including solar electricity and solar hot water heating. TFS has installed over two megawatts of solar power in southern Arizona. Luis Ibarra and Teresa Rosano founded Ibarra Rosano Design Architects in 1999, since earning recognition as one of Arizona’s top design firms for their modern site-responsive architecture. Their internationally published work has received over sixty design awards. With their first project, the Garcia Residence, they were selected by Architecture Magazine to represent their state in its issue on “the Arizona School” – an issue dedicated to the design vanguard of Arizona. Julio is, first and foremost, a family man. When discussing the need for renewable energy and action against global warming, Julio does so with an outlook of hopeful optimism, viewing each effort as a step towards ensuring a healthy, well-cared for planet for his grandchildren to inherit. "I want my grandchildren to live happily on this planet," says Julio, "and the only way for my grandchildren to live happily on this planet is to begin by reducing how much we pollute now." Julio, in his devotion to environmental stewardship, does not plan to end his green efforts at solar: with plans to transition his family to electric vehicles, and more in the works, the quest to minimize his personal and family footprint is of great importance to him. "I feel very satisfied because making the switch to solar is a project that I had been wanting and planning for a long time. I feel very happy to have fulfilled a goal I set out for myself." In addition to environmental responsibility, Julio admires the accuracy and transparency of modern solar systems on a technical level: "It’s a system that truly works on its own. I know exactly how much energy the system is generating, and I know how much energy I’m using. It has very precise meters - it really is a wonderful thing, a wonderful system." Visit our 'Case Study' page for Julio to see his solar system information, and be sure to share his story! For TFS customers Terri and Carol, the decision to go solar was one motivated by sustainability in both the ecological and financial sense. We recently sat down with Terri and Carol to discuss their experience with going solar, and what they have to say to others who may be on the fence about making the switch. "I had been learning, from researching and talking to people, that solar was an option that would make a difference in terms of not only an ecological context, but also in terms of our electric bill. That was big - and in the summer, when we’re running AC, that’s a big issue. We were interested in working with TFS because I had talked to friends who had worked with them, and I knew that they walked their talk. I’ve seen some of their employees riding bicycles with all of their materials rigged up so they can go to job sites - it was just interesting to me that they were interested in sustainability themselves separately from the business. If other people are interested in going solar, I would absolutely encourage them because we have all these beautiful sunny days and it’s a great way to move towards sustainability and make this a better place for everybody. 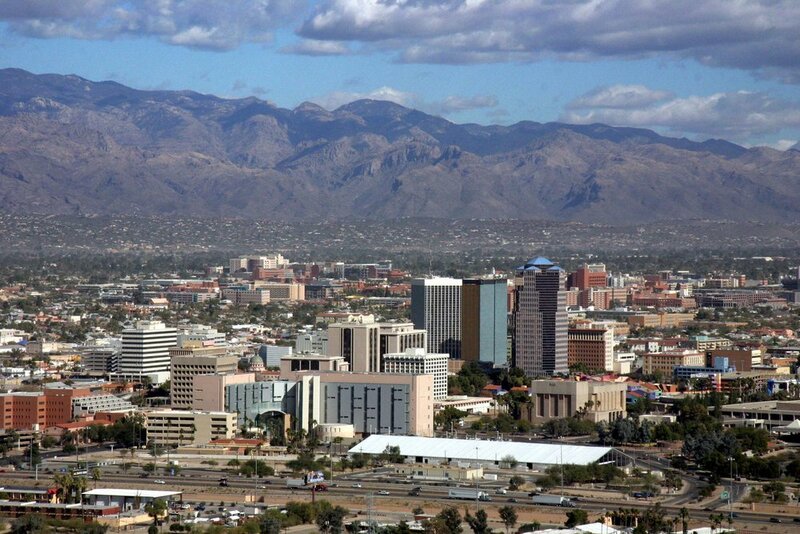 Look at days like today, and most days here in Tucson, we’ve got to use that sun, so we’re happy with that!" Keep an eye out for our upcoming Solar Story video, featuring Terri and Carol, produced in collaboration with our good friends at Edible Baja! Surf Thru is an incredibly unique company: Being a carwash, they operate within an industry entirely based upon the usage of water, yet that doesn't stop them from setting their goals on water conservation, looking to reduce their environmental footprint as much as possible without sacrificing the quality of their service. An average load of laundry uses roughly 45 gallons of water. A full carwash at Surf Thru uses as little as 10 gallons - all of which are recycled safely back into the environment for reuse. When cars are traditionally washed directly on the street or pavement, water runoff carries waste along with it into storm drains, resulting in as much as millions of gallons of fuel and motor oil filtering directly into our storm drains and rivers. Surf Thru decided to go solar with TFS as part of their continuing effort to reduce their water consumption. With their 113kW solar system, 94,614 gallons of water that would otherwise be used to conduct their required electricity are offset every year! A hot topic around solar in Arizona these days is net metering. Tucson Electric Power (TEP) had submitted a proposal to the utility governing body, the Arizona Corporation Commission (ACC), earlier this year requesting a major change to net metering that would not be in the interest of homeowners wanting to go solar in the future. TEP recently withdrew its initial proposal to the ACC to change net metering rules, however, TEP has indicated its intention to resubmit the same proposal as part of a rate case sometime this fall. The ACC is not planning on deciding the case until late summer or early fall of 2016. TEP has indicated it is still going to ask that any excess power sent back to the grid will automatically be converted into a dollar amount credit at a rate of $.058/kwh, rather than at the customer's retail rate. TEP will likely ask that this change to a less favorable net metering policy be applied to any customers who submitted a TEP solar contract after June 1, 2015. The ACC can, of course, either accept this proposal as is, deny the proposal, or choose parts that they feel are appropriate. One of the AZ Corporation Commissioners stated that the ACC will not engage in retroactive rate-making. ACC Staff has also stated that they will seek a solution that applies to all customers irrespective of any grandfathering dates. Based on this, prospective customers should assume that rates will change, and that savings from grid tied solar will be less than it is currently. But it is unclear what the form or magnitude these changes may be. With the existing net metering rules, solar energy systems are sized so that "over-production" (producing more solar energy that can be used in the moment) will occur both seasonally and daily, in the middle of the day. With the proposed net metering policy changes, this excess energy would no longer be exchanged equally for energy use later, but would instead be compensated at a much lower rate. For solar customers who are concerned that the ACC will adopt TEP's proposed net metering changes, or something similar, we can size solar energy systems smaller than would make sense under the existing net metering rules. Additionally, many customers are choosing to proceed with solar systems sized to meet 90-100% of their energy needs under the current net metering rules, hopeful that the ACC will rule in favor of solar customers. Although the ACC may ultimately decide something completely different which would dictate a different Analysis, an easy way to approximate the effects of TEP's proposal is to assume solar energy is worth 8 or 9 cents per kwh, as compared to 10.5 to 11.5 today. Also, if your household uses a lot of energy during the day (you are home most days, or have a pool pump) you will be less effected than someone who's house is shut down during the day.